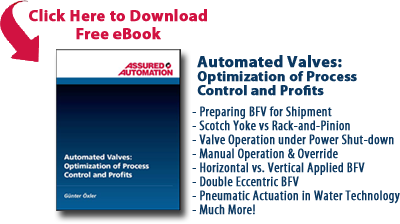 Right now we are on the Home Page of the Assured Automation website. We try to give you as much information as we can in order to make a decision quickly. Our Home Page gives a little description of every valve that we offer, and as you go down, you can see that the picture changes in the left hand side. What we’re going to do today is go to the ST Series, click on that, and this is our Product Page. Our Product Page gives you more detailed information and it gives you some different specifications. If you click on this and see from the specifications that this is not the correct valve, you can quickly back out, chose another valve, and go back in and see that valve. We try to make things as quick as possible without too many clicks to get what you’re looking for. Right now we’re going to click on Mr. Configurator, which takes us to the valve configurator. In order to configure a valve, we have three steps in order to get your quote. That’s it. Steps on through … four steps, I’m sorry, steps one through four. And as you’ll see, after step two, this picture will start changing, as well as the model number, price, and its description will start to change. The first step is to select valve and body options. We have two different types: Lug and Wafer. Lug goes up to 24 inch, Wafer goes up to 12. We’re just going to click the three inch Lug, which is pretty standard, and your next option is the stem extension. The stem extension is just what it’s called – it raises the stem of the valve in case your valve is underground, under water, in a pit, somewhere where you don’t want a guy going down there to open and close it, and you don’t want your operator down there as well. The only information we need is this distance. The distance is how high the extension will be; we measure it from the base of the mounting pad on the actuator to the top flange of the valve. We just put this in inches and we have a minimum of 12 inches. So if you put that in, we will add the stem extension when we assemble the valve. Your next option is seal material. Our two options for seal material are EPDM or BUNA. The disc is always stainless steel, so that is not an option at this point. The second step is to select an actuator type and their options. We have three different operators: pneumatic, electric, or manual. We’ll start with our pneumatic operator. You can see the picture starts to change as well as the model number, price, and we’re building a base description at this point. We have two different pneumatic actuators: our O Series, which is a modified Scotch-Yoke, usually our more economical pneumatic operator, and our E Series, which is Rack-and-Pinion. In both of these we also have two different options: Spring Return, which is fail-closed, which would be air to open, spring to close, fail-open, which would be air to close, spring to open, or Double Acting, which is air to open, air to close. This is the same for the E Series. I’m going to choose the 80 psi Spring Return fail-closed pneumatic operator, which is pretty standard. Now with our Pneumatic Actuator, we have a couple different options or accessories: a Solenoid Valve, a Limit Switch, or Positioner. We’ll start with the Solenoid Valve. We have weather-proof or explosion-proof. When we click on the weather-proof, you can see the picture changes again; it builds on to the model number, it changes the price. You have three different choices: you have a cord grip, DIN connector – where you have to wire into the DIN – same thing with the ½ inch conduit, you wire the DIN connector. We also offer the cord set where we wire the DIN and we offer you a 6 or 15 foot pigtail – or lead. After you decide which one is right for you, you chose the voltage you’re looking for: either 120 Volt AC or 24 Volt or 12 Volt DC. The only other option we have is explosion proof. There’s only one option, it’s a conduit connection. Its UL and CSA Approved, but again, you still have your options for voltages. The next option is a Limit Switch, again its weather-proof or explosion-proof. The first one is weather-proof: it’s a very standard mechanical switch, our YF Switch. We also have pug type in an AC/DC switch or just DC alone. The final option for Limit Switches is our explosion-proof Limit Switch. This is a Class 1 DIV 2, it’s a proximity switch, there’s actually a light on the proximity switch so you can see through the cover from across your plant. We also have Class 1 DIV 1, which is an aluminum cover. We have proximity as well as mechanical. Your final option for the Pneumatic Actuators is Positioner. By the way, for the Solenoid Valves and Limit Switches, you can choose both of them as an option. But the Positioner, you cannot. It’s just a Positioner. We have a Pneumatic Positioner where it’s a 3-15 PSI control air, this way you can control your Butterfly Valve anywhere from fully closed to fully open (it’s not just open and closed). And we also have Electro-Pneumatic, it’s a 4-20 mA signal, and again is fully closed to fully open. Our final option is the same thing; it’s a 4-20 mA signal with an explosion proof package. The other operator type is Electric, and we have three different Electric Operators. One is our K Series, which goes all the way up to 20 inch. It’s just available in 120 Volt. We also have our I Series, which is 120 and 24 Volt AC, as well as 24 Volt DC. This one we can use up to 8 inches; and also if you’re looking for an electric positioner on here, 10 Volt DC 4-20, the I Series is the only one we offer. If you do need something over 8 inches, you just need to call our sales staff and they will help you with that. We don’t have that available on the configurator. We also offer the explosion-proof which is good up all the way up to 24 inches. Our final option is a manual operator. We have a basic lever, 10 position handle that is good up to 8 inches. Once we get to 10, the configurator forces you to the gear box. So anything 10 and above you have to have a gear but it is optional on any of the other ones. We also offer a chain wheel option, which is if the butterfly valve is way up in the ceiling and you want the guy operating from the ground, you just tell us how many feet you want the chain and we will send the chain wheel along with the chain in the order. After you’ve made your decision which valve you want, I’m just going to go to 3 inch standard 120 Volt K Series Actuator, the next option is what’s your accessories? We have installation nuts and bolts – and if you choose this option on this valve, it’s going to give you the set of nuts and bolts for this particular valve that you just configured. So if you go into cart and come back in to do another one, you have to do this every time because you have different sizes and each size carries its own number of bolts that you need. The same this is true for pipe flanges. We offer slip on, weld neck standard, and weld neck heavy, and if you choose this, we will send you two for this specific size. Finally, we can add this to cart. Once you get to cart, you can do a couple of things here. You can go back and add another valve to the cart, if your project can take many valves. You can see right up here, it keeps your cart total. You can also go back to the main Home Page or main storefront and add a different type of valve. The other really nice thing we have is added notes, so I’m going to put my name here, especially if this is part of a project. It keeps the notes with this valve, or with all the valves that you put in your cart. After that we can go to print. If you print it out at this point, then you just print this window and you have a hard copy of the quote. You also have the option to email a quote. This is if you want to email yourself a copy. You enter your email address; you could also put anybody else’s email address also. This is the subject that will show up in the email. And then, we’ll send it. What I’ll do is show you what it looks like. And, in the email, that’s what the quote looks like. It still comes with all the notes that were there, and you are ready to go. And we also have a check-out now. Just like any other check-out, you can click here and you can process your order like you would at any other store. This entry was posted in Installation and Training, Latest News and tagged Butterfly Valve, Butterfly Valve Stem Extension, Butterfly Valves, Electric Actuator, Limit Switches, Lug Butterfly Valve, Pneumatic Actuator, Resilient Seated Butterfly Valve, Solenoid Valve, Wafer Butterfly Valve. Bookmark the permalink.